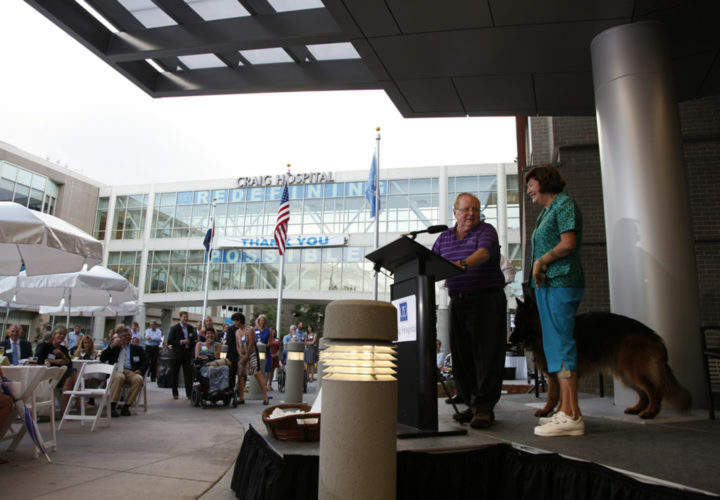 Englewood, Colo.— The Craig Hospital Foundation has received a recent gift of $4 million from Dave and Gail Liniger, founders of RE/MAX, LLC. The donation was made to Redefining ROI: The Campaign for Craig Hospital, the capital campaign that will fund Craig’s ambitious expansion and renovation project. In 2012, the Linigers gave $10 million to the project. The Linigers made the surprise announcement of their additional gift at a donor celebration on August 13. At the event, the bridge connecting Craig’s East and West Buildings was formally renamed the Liniger Bridge to Independence. When Craig Hospital patients are nearing discharge, they move from Craig's West Building to the East Building. In the East Building, patients are expected to take on a majority of their personal care activities, relying less on the support of nurses and technicians. "Crossing the bridge" both literally and figuratively signifies a return to independence. “It’s an extraordinary honor [to have the bridge named after us] because independence is freedom, independence is a chance to recapture what you were before you were injured.” said Dave Liniger at the event. The Linigers have a personal connection to Craig Hospital, as both have spent time as patients. Gail rehabilitated at Craig in 1984 following an injury sustained in a plane crash. Dave was an inpatient at Craig in 2012, learning to walk again following a staph infection that left him paralyzed. Dave wrote a book, “My Next Step: An Extraordinary Journey of Healing and Hope” about his experience with his illness and recovery. The Linigers have long been involved in charitable activities. They own Sanctuary Golf Course, where numerous charity golf tournaments have raised more than $85 million for Colorado charities. They founded the Denver-area conservation center The Wildlife Experience, a 14-acre, 111,000-square-foot facility designed as an educational center and gathering place for social, civic and business activities. In 2015 they gifted the building to the University of Colorado. Since 1992, RE/MAX has been the official real estate sponsor of Children's Miracle Network Hospitals. RE/MAX has been a sponsor of Susan G. Komen for the Cure since 2002. The Liniger gift will help fund Craig’s four-year, $90 million expansion and renovation project that will redefine Craig’s inpatient and outpatient experience. When completed in 2016, the project will have added approximately 85,000 square feet of new space and renovated approximately 135,000 square feet of existing space. The hospital is funding $40 million of the project through cash reserves and the sale of bonds and the Craig Hospital Foundation is raising $50 million through its “Redefining Return on Investment (ROI)” capital campaign. As of August 27, the Foundation has raised $48.4 million towards the goal.